2004 – DrSci, Zoology, Zoological Institute Russian Academy of Sciences, Saint Petersburg. Dissertation on "Systematic and phylogeny of bear family (Carnivora, Ursidae)". 1980 – PhD Physical Geography, Leningrad (Saint-Petersburg) State University. Dissertation on “Pleistocene dynamic of altitudinal belts in Caucasus by theriology data”. 1974 – M.S. Physical Geography, Leningrad (Saint-Petersburg) State University. Thesis on heterochrony of development steppe landscape USSR in Anthropogene by change of mammal fauna. 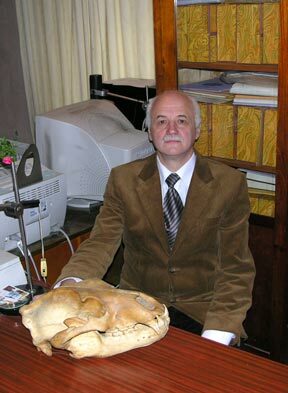 2008 to present - Principal Research Scientist, Laboratory of Theriology, Zoological Institute of the Russian Academy of Sciences, Saint-Petersburg, Russia. 2004 to 2008 – Leader Research Scientist, Laboratory of Theriology, Zoological Institute of the Russian Academy of Sciences, Saint-Petersburg, Russia. 1982 to 2004 - Senior Research Scientist, Laboratory of Theriology, Zoological Institute of the Russian Academy of Sciences, Saint-Petersburg, Russia. 1975 to 1982 – Research Scientist, Laboratory of Theriology, Zoological Institute of the Russian Academy of Sciences, Saint-Petersburg, Russia. 1967 to 1974 - Research Assistant, Laboratory of Theriology, Zoological Institute of the Russian Academy of Sciences, Saint-Petersburg, Russia. 2002 to present – Member of Advisory Board of Russian Journal of Theriology. Systematics, phylogeny and morphology of mammals (Carnivora), fauna and taphonomy of Paleolithic sites (Caucasus). Baryshnikov G.F., Tleuberdina P.A. Late Miocene Indarctos (Carnivora, Ursidae) from Karabulak Formation of the Kalmakpai River (Zaisan Depression, Eastern Kazakhstan) // Proceedings of the Zoological Institute RAS, 2017. Vol. 321. No 1. P. 3-9. Baryshnikov G.F. Late Pleistocene Felidae remains (Mammalia, Carnivora) from Geographical Society Cave in the Russian Far East // Proceedings of the Zoological Institute RAS, 2016. Vol. 320. N 1. P. 84-120. Soubrier J., Gower G., Chen K., Richards S., Llamas B., Mitchell K.J., Ho S.Y.W., Kosintsev P., Lee M.S.Y., Baryshnikov G., Bollongino R., Bover P., Burger J., Chivall D., Crégut-Bonnoure E.-C., Decker J.E., Doronichev V.B., Douka K., Fordham D.A., Fritz C., Glimmerveen J., Golovanova L.V., Groves C., Haak W., Higham T., Hofman-Kaminska E., Krause J., Larson G., Limmel A., Scheu A., Schnabel R.D., Taylor J.F., Tokarska M., Tosello G., Plicht van der J., Loenen van A., Vigne J.-D., Vorobiev A., Wooley O., Zazula G., Orlando L., Kowalczyk R., Shapiro B., Cooper A. Early cave art and ancient DNA record the origin of European bison // Nature Communications, 2016: 7:13158; DOI: 10.1038/ncomms13158.